Claude Monet (1840–1926), Rocks at Belle-Île, Port-Domois (1886), oil on canvas, 81.3 x 64.8 cm, Cincinnati Art Museum, Cincinnati, OH. Wikimedia Commons. In the previous article, I looked at paintings of the coast made from above the beach, on cliffs, up to and including the Pre-Raphaelites. This second and concluding article concentrates on the impact of Impressionism in the late nineteenth century. Another puzzling artist in this respect is Winslow Homer, who came to England to spend a period painting the fisherfolk of Cullercoats, in what is now Northumbria, at the height of the Impressionist movement. Homer’s very large series of watercolours painted at Cullercoats shows a few carefully delimited clifftop scenes. But like William Holman Hunt’s Our English Coasts, 1852, the more distant views of the sea are confined to small windows. 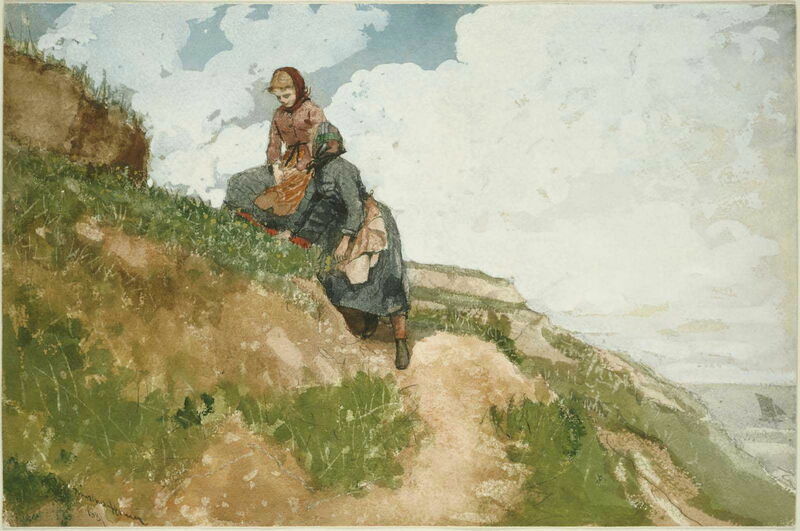 Winslow Homer (1836–1910), Girls on a Cliff (1881), watercolor over pencil on paper, 32.2 × 48.5 cm, Museum of Fine Arts, Boston, MA. Wikimedia Commons. I did once find a fuller view made by Homer from cliffs away from Cullercoats, but have been unable to locate it again. Looking through his many coastal paintings from his time at Cullercoats and after, he, like Turner, much preferred to paint down at the level of the sea, and hardly ever used cliffs as a viewpoint. This changed with Impressionism – in fact, not so much with Impressionism as with a single Impressionist artist, Claude Monet. Through the 1880s in particular, while he painted views from the water’s edge, he also worked on the clifftop, with spectacular success. 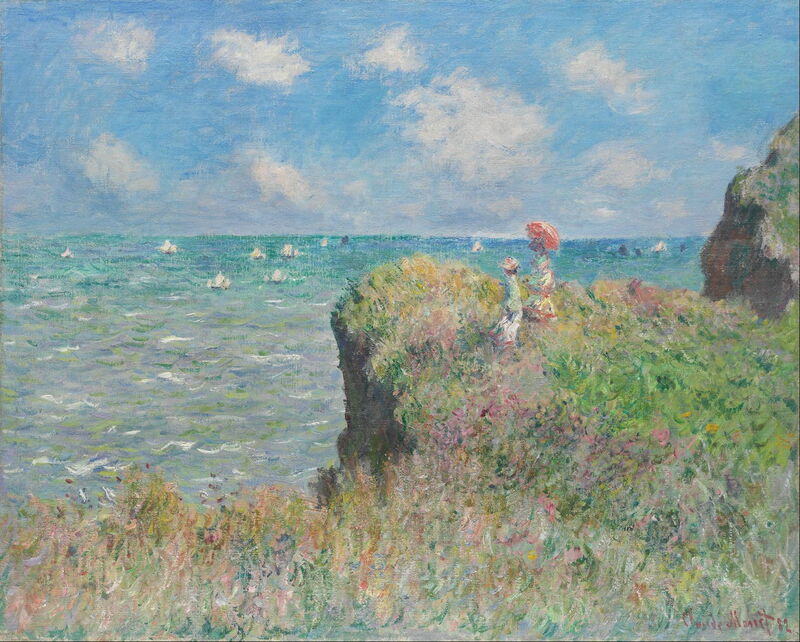 Claude Monet (1840–1926), Cliff Walk at Pourville (1882), oil on canvas, 66.5 x 82.3 cm, Art Institute of Chicago, Chicago, IL. Wikimedia Commons. 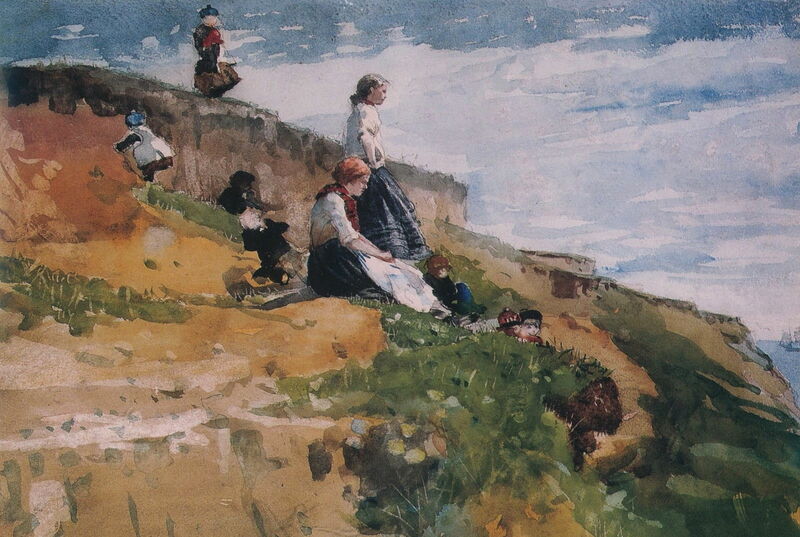 Among the earliest of his clifftop works are those above the seaside resort of Pourville-sur-Mer, on the Channel coast near Dieppe, such as Cliff Walk at Pourville (1882). 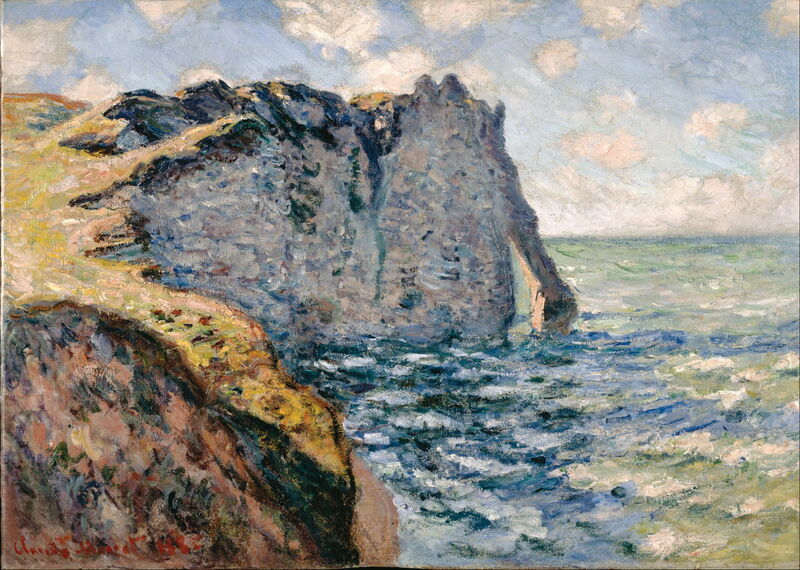 Claude Monet (1840–1926), The Cliff of Aval, Etrétat (1885), oil on canvas, dimensions not known, Israel Museum מוזיאון ישראל, Jerusalem, Israel. Wikimedia Commons. He also painted many of his famous views of the cliffs near his home town of Le Havre from above, as in The Cliff of Aval, Étretat (1885). With limited dry land available on the beach there at high tide, this may have been a practical necessity, of course – something which is always an important factor for landscape painters working on the coast. When he later stayed on the island of Belle-Île, at the northern end of the Bay of Biscay, off the coast of Brittany, its clifftops gave spectacular views, such as these Rocks at Belle-Île, Port-Domois (1886). 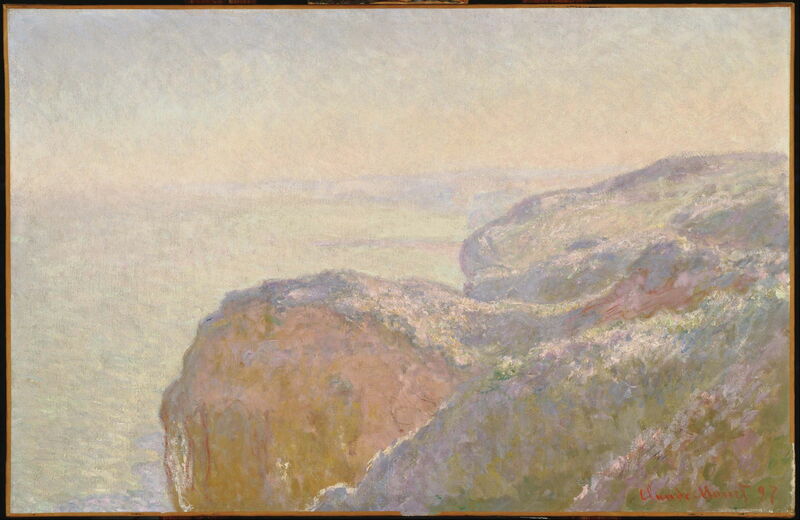 Having stressed throughout the value of the clifftop for obtaining good views, it is also good to see Monet later using a viewpoint for a thoroughly murky view, in Val-Saint-Nicolas, near Dieppe (Morning) (1897). But in those conditions, any view from below would have been far less suitable for painting, I suspect. 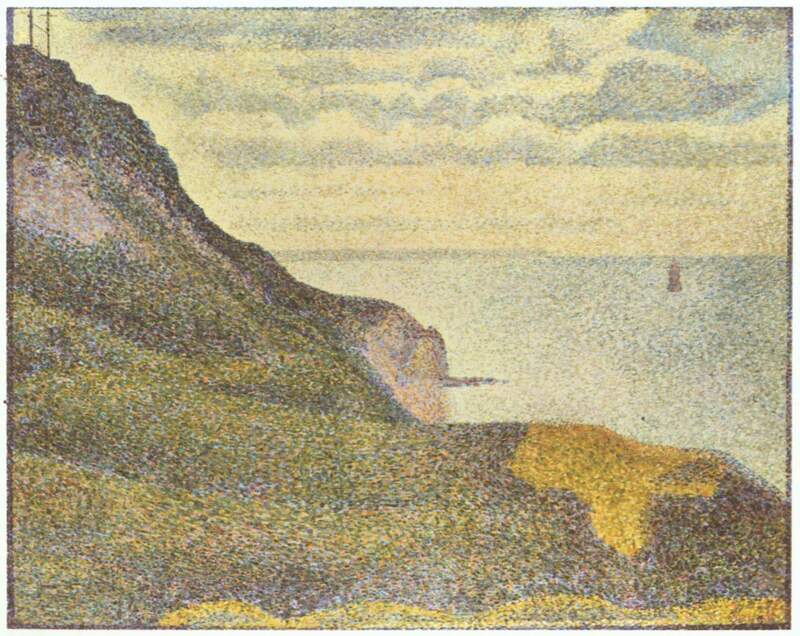 Georges Seurat’s summer visits to paint the northern coast of France also took him up onto the cliffs. Among the series which he painted of Port-en-Bessin in 1888 is this view from its cliffs. Better known for his huge canvases of beach scenes, in his later career in particular Joaquín Sorolla painted some superb coastal landscapes from high points, here on the Spanish Mediterranean coast between Benidorm and those beaches of Valencia. When the Post-Impressionists moved the focus of outdoor painting from Paris and northern France down to its Mediterranean coast, like Monet in the north, they found its cliffs were excellent viewpoints. 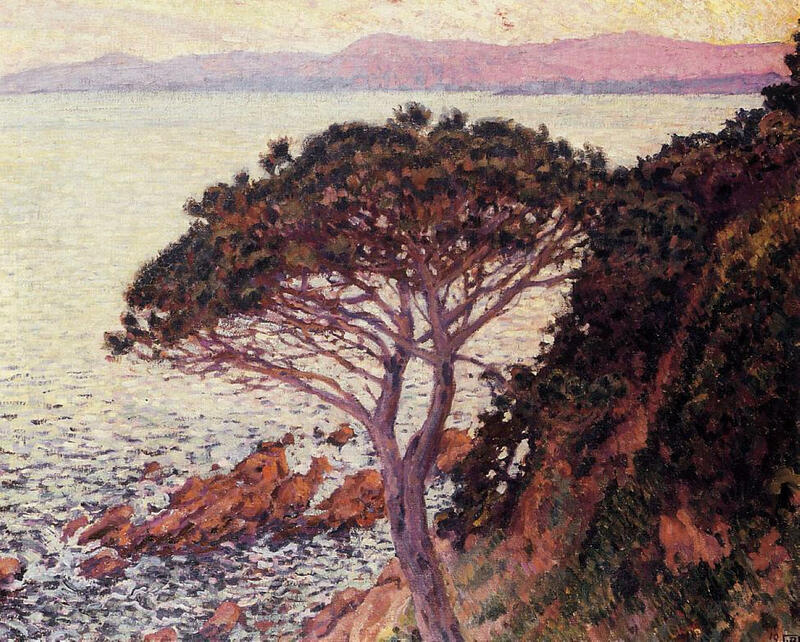 I show three examples over a period of a decade from Théo van Rysselberghe. 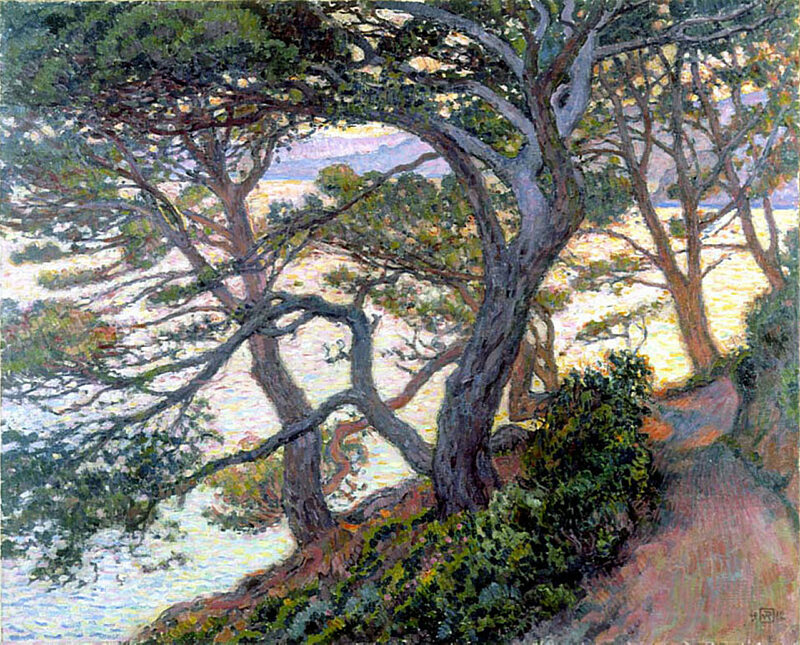 Théo van Rysselberghe (1862–1926), Pines at Pointe Layet (1912), oil on canvas, 81 x 100 cm, Private collection. WikiArt. 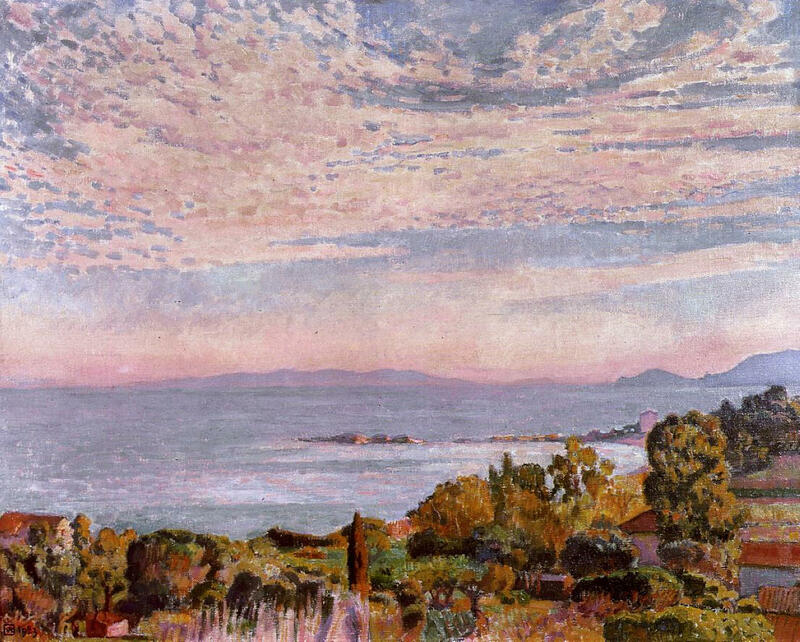 Théo van Rysselberghe, la Baie de St Clair (The Bay of St Clair) (1923), oil on canvas, 91.4 x 73.6 cm, Private collection. WikiArt. Finally, this move from the beach to the viewpoint was more general. 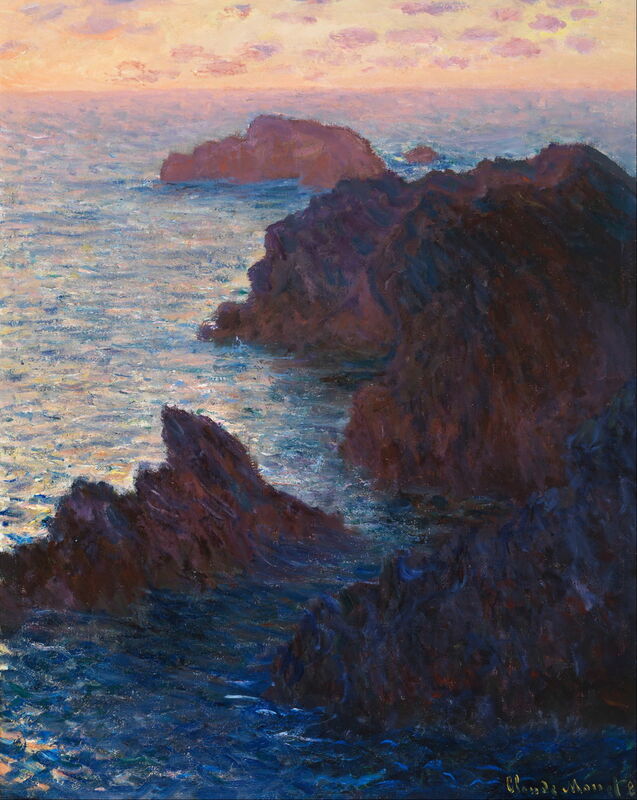 The Californian Impressionist Anna Althea Hills used it in what is probably her finest painting, Spell of the Sea, made near Moss Point at Laguna Beach in 1920. Like Monet and van Rysselberghe, she enriches the view too. 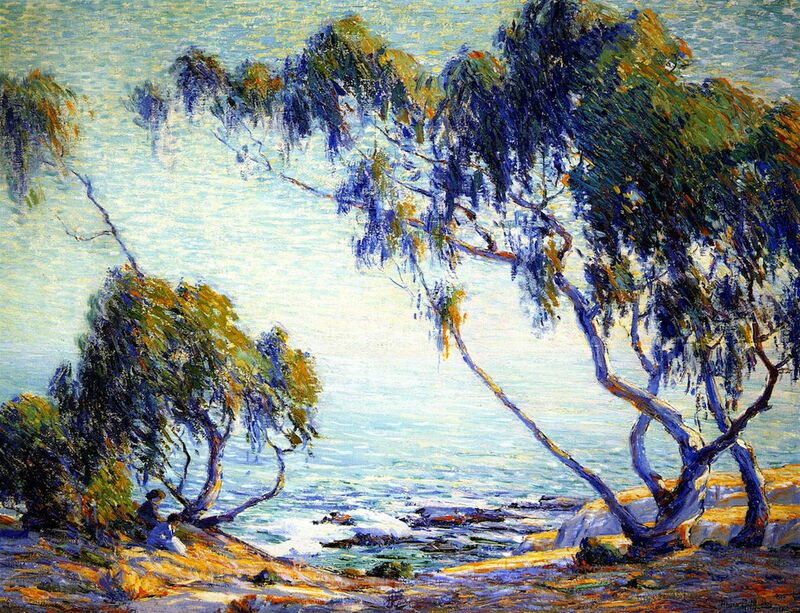 Anna Althea Hills (1882-1930), Spell of the Sea (Laguna Beach, near Moss Point) (1920), oil on canvas, 76.2 x 101.6 cm, Private collection. The Athenaeum. Posted in General, Life, Painting and tagged hills, Homer, landscape, Monet, painting, Seurat, Sorolla, van Rysselberghe. Bookmark the permalink.